Are you planning your wedding and still need to organise your wedding rings? Instead of searching the high street stores, why don’t you spend a day together, design and make your own wedding rings and make your special day even more memorable! I can help you create romantic symbols of your love by teaching you how to make your wedding rings together, with your own hands. You can come as a couple, or on your own if you are planning a surprise, and I will guide you through the process of making your very own wedding rings. The session will cover basic jewellery making skills such as forming, piercing and soldering. The class is open to anyone and you do not need any previous jewellery making experience. (class does not include setting gemstones, there are separate classes for this). The make your own wedding ring jewellery class, is just one couple at a time, so you will be able to enjoy this memorable day together. Classes will be held in my WASPS Studio in Dundee. Contact me to discuss a suitable day and time for you and your fiance. Make your own wedding rings (One Day Class 4-6 hrs)- Couples class £250 and 30-45mins consultation (silver included) other precious metals will be charged extra. *price is dependant on the thickness of materials you choose. Once we have had the consultation and discussed specific materials, I will get back to you with price per ring. This has to be paid at least a week before the day of your wedding ring class. On the day of your wedding ring class, you and your fiance will learn how to make a silver wedding ring from scratch and you can take them home with you. Price includes tea, coffee, light refreshments, silver and all tools are provided to make your own rings. Plus some special surprises. I will help you to design your wedding rings. I will ask you to fill in a consultation form before we have our wedding ring consultation which will last between 30-45mins. During the consultation we will discuss the design and what materials you would like to make your rings in. I will get back to you with a price for the materials and if you are happy with the extra cost, I will order in the correct materials for you and have them in stock for your make your own wedding ring class. It normally takes a few days to receive the materials so you can have your class a few days after the consultation. I would need you to book and pay for the class before the consultation and you can pay for the (gold, palladium or platinum) materials after our consultation. Any questions just ask. 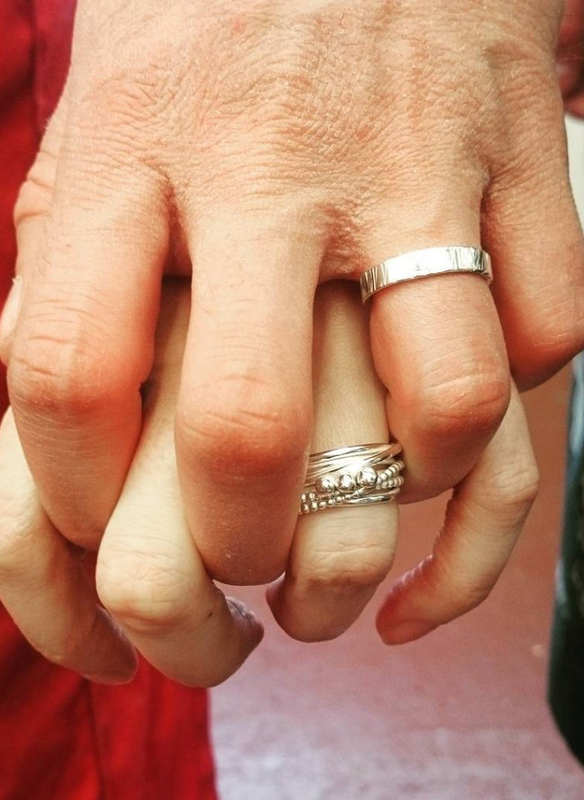 This is a picture of Dan and Emma’s wedding rings. They made each others rings and made them in silver. So it doesn’t need to be tradition wedding bands, they can be as unique as you. what date are you free to come in to make your own wedding rings jewellery class? Anything you are not sure of? Contact me to discuss booking your class. Not wanting to make your own wedding rings but still want them to be unique? I can make them for you. Just get in touch.